The Redback Spider is a species of highly venomous spider. The young have white colouring on them and their venom can be just as strong. Redback Spiders are found Australia-wide but are most common in urban areas living under roof eaves, floorboards, shelves, flower pots or in garden sheds. The adult female is easily recognised by her spherical black body with a prominent red stripe on the upper side of her abdomen and an hourglass-shaped red/orange streak on the underside. Females usually have a body length of about 10 millimetres, while the male is much smaller, being only 3–4 mm long. 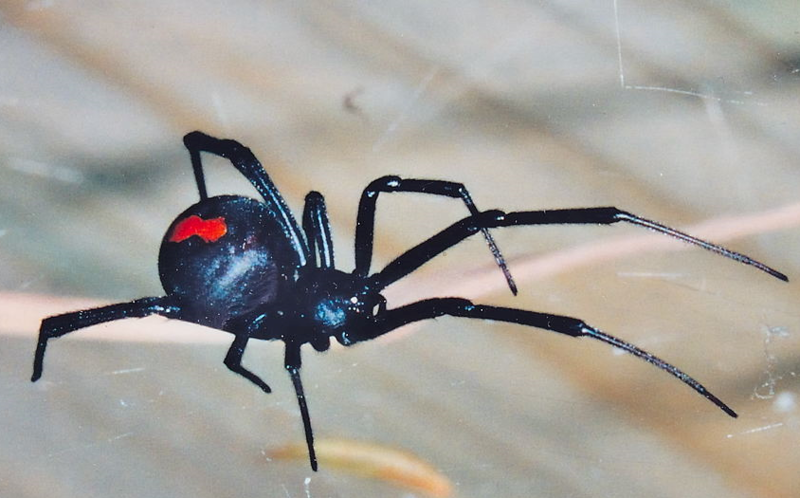 What Harm can be Caused by a Red Back spider. What Should I do if a Red Back Spider bites me or my Family? We are not medical practitioners, get expert help immediately. Redbacks are common in urban habitats such as garden sheds, under steps or logs and around swimming pools or piles of rubbish. They build webs in dry, sheltered sites, often with the upper part of the web hidden from sunlight. The spider hides in a funnel-shaped retreat at the top of the web. The lower part of the web consists of a forest of mostly vertical, sticky catching threads.